I love everything about this soup. Cooking the spices before adding the liquids was a trick I learned while I was in Italy. It enhances the flavours and I absolutely love the smokey flavour from the smoked paprika. I served it with a simple salad so I could just savour the amazing the taste. I hope you enjoy it as much I did. Preheat the broiler to high. Line a large baking sheet with parchment paper. Arrange yellow pepper, and tomatoes, onto baking sheet. Broil the vegetables until they start to turn a golden brown, approximately 5-8 minutes. While the vegetables are in the oven, heat olive oil in large soup pot, over high heat. Add the onion, garlic, carrots, and celery. Reduce heat to medium high and cook vegetables until onions turn translucent and carrots begin to get tender. This will take approximately five minutes. Add all of your spices and stir well. If you are using white wine, add it now. Cook for another 2 minutes to release the flavours and aroma of the spices. Pour in vegetable stock and bring to a gentle boil. Remove the vegetables from the oven and carefully remove the skins from the pepper, and tomatoes. With a handheld blender (or regular blender) puree the pepper and tomatoes until there are no more chunks. 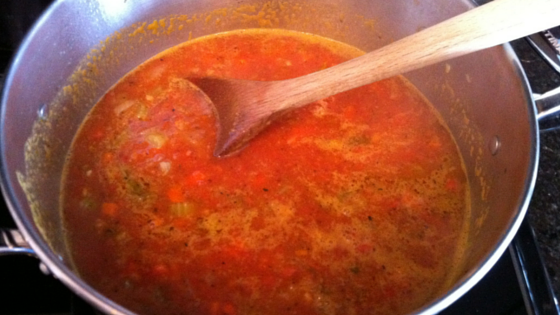 Add processed vegetables to the soup pot, stir, lower heat and simmer for another 10 to 15 minutes.